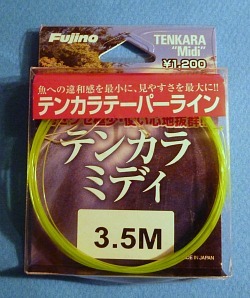 Fujino Tapered Lines: Tenkara Midi, Midi Soft, Soft Tenkara and White Tenkara lines are hi-vis tapered nylon lines produced by Fujino in Japan. They cast nicely and settle to the water softly. 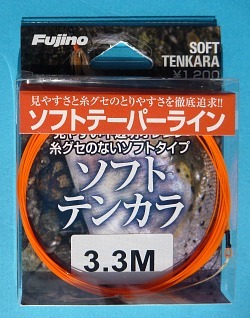 Fujino also makes Soft Tenkara Long Type lines for those who fish long line tenkara, or for those who fish with a shorter line but use a long line for casting practice. Conceptually, the Fujino tapered lines are similar to the knotless tapered nylon leaders that fly fishermen have used for decades. There are a few significant differences, though. The most obvious is the color. The Midi and Midi Soft are fluorescent green. The Soft Tenkara is fluorescent orange and the White Tenkara is a milky white. They are produced in lengths ranging from 3 to 5 meters and they are formulated to turn over well when cast with a tenkara rod. The fluorescent green Midi line, which was the first line in the series, tapers from Japanese line size 10 down to size 3. 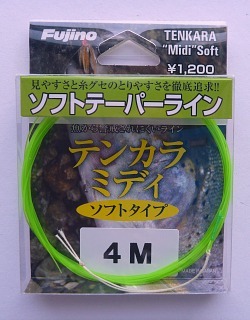 The three "Soft" lines, which include the fluorescent orange "Soft Tenkara," the milky white "White Tenkara" and the fluorescent green "Midi Soft" all taper from size 8 down to size 3. The different lines come in different lengths. I've written a lot about nylon's big disadvantage, which is it's low density relative to fluorocarbon. It's big advantage, though, is that it takes dye really well so you can get bright colors. 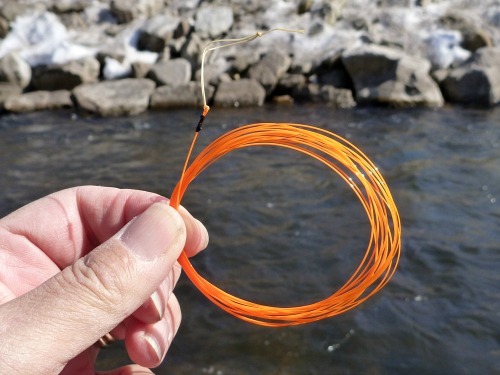 The Tenkara Midi, Soft Tenkara and Midi Soft lines are BRIGHT. I mean they are REALLY BRIGHT. They just pop. If you have watched any tenkara videos, you probably have noticed that you cannot see the line, no matter what line the angler is using. In the TenkaraBum video that Roamads shot, I used both the Soft Tenkara and the Tenkara Midi lines and both were quite visible. If the camera can pick it up, your eyes, which are better by far, will have no problem seeing either line. I have to say that the green Midi can get lost against a green background, as indicated in the top part of the photo to the left. Against the water, though, it is extremely visible. That is perhaps the biggest advantage to fluorescent orange lines. They are incredibly bright and don't blend into any background. 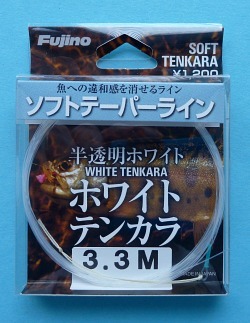 For anglers who are concerned that the brightly colored lines will scare the fish, Fujino has introduced the White Tenkara line. The line is a milky white translucent line that is certainly visible enough except when looking directly into glare. It should be extremely stealthy, because it will be very hard for a fish to see the translucent white line against the sky - even on a clear day but especially on an overcast day. While brighter color is a definite advantage that nylon has over fluorocarbon, its lower density is a definite disadvantage. 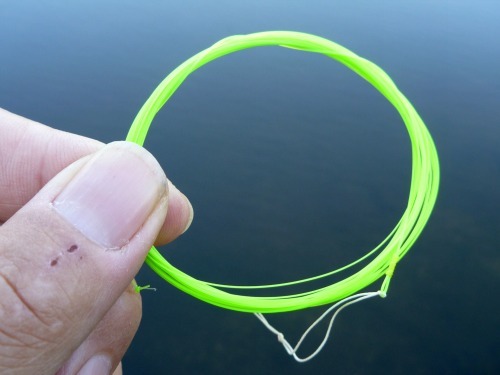 Nylon just doesn't cast as well as fluorocarbon if you have to cast into any breeze at all. The taper that is built into the Fujino lines definitely helps their casting qualities. The lower density actually does have some redeeming features, though. The line settles to the water more softly than fluorocarbon. Also, if you are fishing floating flies (whether dries or poppers) and you do not want your line to sink, greased nylon floats quite well. Despite being tapered lines, I found them to cast better with softer rods than with the stiffer "LT" rods. They would not be my first choice of line for the Daiwa Keiryu-X rods or the Suntech Genryuko, but for most tenkara rods they would be fine. Tight loop with Fujino's new White Tenkara line. It has been quite some time since I have fished with the Fujino Midi and Soft Tenkara lines. When I took the White Tenkara line out for the first time I decided I really liked it. It is definitely visible enough to see well. I didn't fish it in late evening or deep shade, when you might want to switch to the bright orange Soft Tenkara. It is also likely to be a lot more stealthy. I have never felt that brightly colored lines scaree fish, but I know some people think they do. 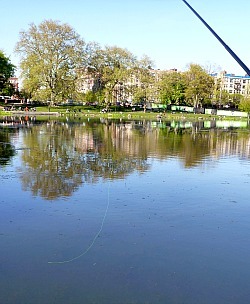 This line, with the sky as a background, should be almost invisible to the fish. 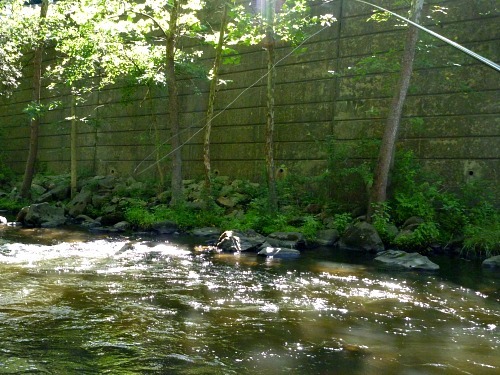 I was actually a bit surprised at how well the Fujino White Tenkara line casts. It may be that I have become a better caster in the last few years, but it might be the line also. I would have to fish it with the Soft Tenkara line back to back. Still, I was impressed and will certainly fish with this line and the Soft Tenkara lines more. The lines come pretty much just like a knotless tapered leader. The tippet end of the line is just a plain end, and the first thing I would do is tie a figure 8 knot in the end of it so that the tippet can be attached the same way it is attached to a level line. From every sale, more than $1 goes to fisheries conservation. I've been doing a lot of on demand/spontaneous teaching this year during events at Sundance Mountain Resort. (Our new home base for Oni School). And the Fujino lines make it so easy for me to teach a basic cast in 5 min or less to people ranging from kids as young as 5 to experienced fly fishers with many decades of fly fishing experience. Fujino Soft lines have become an essential teaching tool for me. I never hit the water without a 3.6m taper line in my pocket. You just never know when you will be teaching someone.